Maunsell left Easton Gibb & Son before the outbreak of World War I (28th July 1914), to join contractor R. Thorburn & Sons as their chief agent. The company was involved in building two government factories for manufacturing explosives. Both were located on former Nobel Industries sites — Alfred Nobel founded Nobel Industries in 1870, merging with three other companies (Brunner Mond, United Alkali Company and British Dyestuffs Corporation) in 1926 to become ICI, now part of the Dutch company AkzoNobel. The first project was at Ardeer, near Stevenston in Ayrshire, Scotland, on the site of Nobel Industries' first explosives factory. The contract was to reconstruct the former Misk Gelatine Works, following damage caused by an explosion in February 1914. The other project was Pembrey Royal Ordnance Factory built among the sand dunes at Cefn Sidan in Carmarthenshire, Wales, where the original dynamite works had been destroyed in 1890. The new plant produced TNT (trinitrotoluene) and was one of Britain's largest munitions factories during World War I. It closed in the 1920s, was rebuilt in 1937 and closed finally in 1965. The land is now part of Pembrey Country Park and the neighbouring industrial estate. In 1917 the 33 year-old Maunsell was called up as a commissioned officer in the Royal Engineers. He served in France for a year, again making good use of his sketch pad and watercolours to record the places he visited, among them Bethune village and the ruins of Fleurbaix church (both painted in 1918). But his engineering skills were being squandered in the trenches, and in October 1918 he was recalled to England and sent to John Ver Mehr's (?-1939) Westminster offices as chief engineer. The German U-boat blockade of British ports increased the demand for shipping — as well as suitable defence measures — and the wartime shortage of steel made concrete a realistic alternative construction material for both aims. From 1917 Ver Mehr had a yard on the south bank of the River Adur at Shoreham Beach, West Sussex, where he built reinforced concrete sea-going vessels. Maunsell was responsible for the design and construction of both the shipyard and the ships (tugs and barges) — quickly nicknamed the Shoreham Creteships as their names all had the prefix 'crete'. The government project revived Shoreham's shipbuilding industry, which had been moribund since the end of the 19th century. Constructing ships using concrete was not without precedent. Frenchman Joseph-Louis Lambot (1814-87) built a small concrete dinghy in 1848, which survives today. 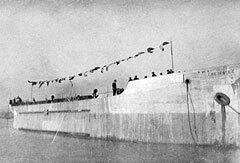 However, this wartime scheme was the largest scale proposal for a fleet of such vessels to date. In all 21 firms received contracts to build 154 ships (only 66 were completed) at 18 shipyards around the country. Ver Mehr's yard built 12 vessels. None was completed before the war ended (11th November 1918). Britain's first concrete sea-going vessel was the Armistice, launched in Barrow-in-Furness in 1919, and the last was the Cretewheel, launched from Shoreham in 1920. While Maunsell was working at Shoreham, as an erstwhile member of the Royal Engineers he also had a role in the Admiralty's secret scheme to construct a series of 'mystery towers' to be deployed across the Channel between Kent and France to intercept enemy submarines and other waterborne threats. The idea was proposed first in 1917 by Alexander Gibb, Maunsell’s former employer and then civil engineer-in-chief to the Admiralty. Though refused initially, the project was approved in 1918 despite its estimated price tag of £12m (roughly £433m at 2009 rates). Gibb, fellow Admiralty employee T.G. 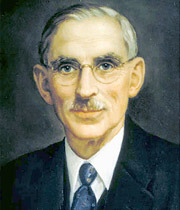 Menzies and electrical engineer Colonel William McLellan (1874-1934) had worked together to invent a way of locating submarines by means of a galvanometer. The range of their devices was only 3-5km, so a line of towers would be needed. McLellan was a founding partner of the consultancy Merz & McLellan, which he and Charles Merz (1874-1940) set up in 1902 (it became part of Parsons Brinckerhoff in 1995). Tower construction comprised a reinforced concrete raft foundation made from interlocking cells, topped with a steel superstructure and gun emplacement. Two of them were built in Shoreham Harbour, but the end of the war signalled the end of the project, and one tower was later dismantled. The other, Nab Tower, was towed into position and sunk in the Solent in 1920 to replace the Nab Light Vessel that marked Nab Rock. It has functioned as a lighthouse ever since — damage from a ship collision in 1999 was repaired in 2001. The method of towing floating concrete structures and sinking them into place was to inform Maunsell’s later designs for the Storstrøm Bridge in Denmark (1933-7) and his World War II defence work — the Army and Navy Sea Forts (see chapter 5). His interests in transportation and maritime engineering stem from his World War I work and would govern the majority of his future and most ambitious designs and constructions. Like Gibb, Maunsell was a brilliant engineer with ambitious ideas, some of them rejected initially but later taken seriously. Their similarities become more apparent with time, and perhaps it is no surprise that their relationship was often difficult. By the time Maunsell worked for Gibb again in 1919, Gibb was director-general of civil engineering at the Ministry of Transport (created 1919) and had been recognised for his war service. In 1918 he received a Companion of the Order of the Bath (CB) for his services to the armies of France and was made a Commander of the Order of the Crown of Belgium for his services to Belgium. Later the same year he received a Knight Commander of the Order of the British Empire (KBE), which was upgraded to Knight Grand Cross (GBE) in 1920 for his work at the Admiralty. Maunsell worked as deputy chief engineer for Gibb, who involved him in two ambitious schemes for the Ministry of Transport. He reported on the first of these in January 1919 — assessing the viability of a rail tunnel 56km long under the English Channel and plotting its course — but the Ministry did not follow it through. The Channel Tunnel would eventually be built by Eurotunnel in 1987-94. The second scheme is one that has yet to be realised — the Severn Barrage. In 1921 Maunsell and Gibb suggested a tidal barrage crossing the river at English Stones, the site of the present Second Severn Crossing (1992-6) built by the Second Severn Crossing Group, which included Maunsell & Partners. The barrage included 4km of dams with turbines and automatic sluices, a ship lock and a road and railway bridge. It was estimated that the barrage would generate 800MW and cost £25m (£691m in 2009) to construct. Their report recognised that South Wales' expanding industries would benefit from more accessible links between England and Wales. At first the scheme was well received, with praise for Gibb for his foresight in combining industry's prime needs for transport and power. It was debated by the Severn Barrage Committee between 1925 and 1933, though neither Gibb nor Maunsell were mentioned. The cost and the economic depression in Britain at the time — the General Strike took place in May 1926 — combined to ensure that no action was taken. Today the Severn Barrage debate continues. Current proposals suggest that a barrage could generate 8GW but it would cost some £20 billion to construct. Maunsell left the Ministry of Transport in 1921, though it is not clear whether he was the victim of government spending cuts or he resigned. However, he was frustrated by the number of his reports and proposals that were shelved and, to his mind, not taken seriously. Now he was out of work and poverty-stricken. But there was good news too — he had met Milicent Geraldine Mockler (?-1978, known as Geraldine), a House of Commons secretary, during his time with the Ministry and they married in April 1922. For more than a year the couple survived on a £100 annual allowance from Geraldine's father, Guy Mockler, a former officer in the Indian Army now living on a meagre pension. At this time it was cheaper to live on the continent, so the couple moved to the Dordogne in France and then to Portugal. Maunsell took piecemeal jobs with contractors wherever and whenever he could. He and his wife filled their spare time creatively — Geraldine making woodcuts and Maunsell painting watercolours. The first half of the 1920s must have been unsettled and difficult. They returned to Britain in 1923 when Maunsell found work as a special assistant at Sir Alexander Gibb & Partners. Like Maunsell, Gibb had left the Ministry in 1921 and had become a consulting civil engineer. He had established the firm in 1922, with offices in Queen Anne's Lodge, Westminster in London. Maunsell became a co-consultant: "... his extraordinary gift of solving unusual problems in unusual ways ... made him ... invaluable". Through Gibb, Maunsell was engaged on the design and layout of extensions to Ipswich Wet Dock and Cliff Quay (1923-7), on the east side of the River Orwell in Suffolk. Ipswich is a thriving port today but back then only small vessels could moor at the quays, so the company was asked to provide a new dock entrance and to construct a 640m long quay wall. The difficulty lay in the foundations, with running sand that had to be removed while men worked in caissons underwater. It was a treacherous job, solved by surrounding the site with a cofferdam, so water inside could be pumped out as the men were working. Sir Alexander Gibb & Partners remained responsible for further improvements to the harbour for decades afterwards, thereby contributing to the town's prosperity. In 1924, Maunsell was offered a job as engineer and agent to contractor Sir William Arrol & Co. and he became resident on and responsible for the Lanark Hydroelectric Scheme (1926-7, also known as the Falls of Clyde). William Arrol (1839-1913, knighted in 1890), a Scottish civil engineer and bridge builder, had studied mechanics and hydraulics at night school. The two small power stations harness the power of three waterfalls on the River Clyde, generating 8.7MW, and are considered to be the oldest stations of this kind in the UK producing electricity for public supply. During Maunsell’s employment with Arrol, he and Geraldine moved to Rosyth in Scotland and then to Clyde Cottage in Lanark, designed by Maunsell himself. Their two daughters, Maureen Edith (1927) and Rosalie Loveday (1930), were born in Scotland. In 1928-30 Maunsell was in private practice and once again in association with Sir Alexander Gibb & Partners. Maunsell helped with the design of the steelwork for Gibb's Kincardine Bridge (1932-6), the first road crossing of the Firth of Forth downstream of Stirling. At the time, its 110m long central span was the longest swing bridge in Europe. Kincardine was a useful introduction to the more significant and exceptional bridge projects that Maunsell would work on in the next decade. It's also probable that Maunsell assisted with the design of the 103MW Galloway Hydroelectric Scheme (1932-6), putting his previous experience to good use. The Galloway scheme was designed by Merz & McLellan and Sir Alexander Gibb & Partners — with the station buildings following the Modernist style popular the time. The huge undertaking covers more than 1,000 sq km and has six power stations and eight dams, with associated tunnels, aqueducts and pipelines. The 1920s were a time of financial hardship that impacted greatly on Maunsell's family, and holidays often were combined with work — particularly site inspections around the UK. Nevertheless, he gained plenty of experience in key areas of civil and structural engineering. Though the next decade was governed by the depression years, Maunsell had good contacts, years of experience with Gibb and the determination to take his family safely through one of the most challenging decades of his career. The concrete barge Cretestile, one of the Shoreham-by-Sea 'Creteships'. She was launched from Shoreham in 1919 but wrecked near Gorlestone, Norfolk, carrying coal from Tyneside on 15th December the same year. The Shoreham-built barges were the smallest of all the concrete barges built in Britain at this time — at 51.8m long, with a 10.1m beam and a hold depth of 4.9m in each of the three cargo holds. 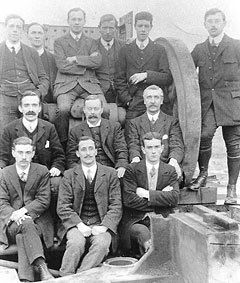 William John Seaman (centre bottom), a specialist in early concrete building, is thought to have worked for Sir Alexander Gibb at Rosyth before moving to Shoreham where he worked on the 'Creteships'. He later returned to Norwich and took over the family building firm of WJ Seaman & Sons. This picture is thought to have been taken in Shoreham, and the man on the left in the middle row looks remarkably like Maunsell, who was in his 30s at this time.